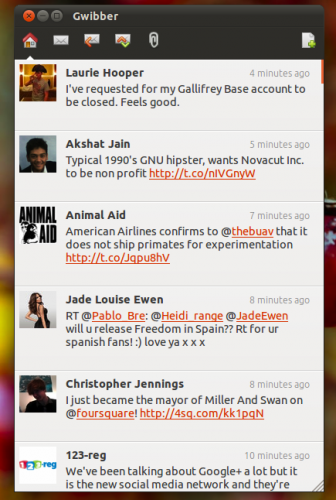 Gwibber Gets Revamped For Ubuntu 11.10: Faster, Lighter, Prettier - OMG! Ubuntu! For despite have a great feature set and support for almost every major social networking site, Gwibber�has been tarnished with a reputation�for being slow, laggy, resource hungry and a notification-nuisance. But come Ubuntu 11.10 Gwibber will be a very different beast. Gwibber 3.1 sees the social app get rewritten and redesigned. The Webkit interface of old has been traded for Vala and GTK3. the layout and look have been streamlined and the result is a fast, responsive and resource-efficient client. “The old python/webkit based client used way to much�memory and it was rendered as a single static view which needed to be�rendered each time anything changed.”�Gwibber developer Ken VanDine told me when I asked about the reasons that led to the big revamp. As an example of just how efficient the ‘new’ Gwibber is Ken told us of a test he did shared with us the results from a test he conducted using the clients. The result was more than�noticeable�when I took the the ‘new’ Gwibber for a spin earlier. Scrolling through Tweets is smoother, switching between views is faster and the appearance of new updates/tweets is far far quicker than Gwibber under Natty. I did take a quick at Gwibber’s resource usage whilst using the old client and then again under the new client. I left both open for the same amount of time (10 minutes) and both were tested under the same Ubuntu installation on the same computer. Old Gwibber used, combined, around 100MB of RAM. The new Gwibber? Just 32MB. Oh how my netbook will rejoice. Gwibber 3.1 comes with a new look designed by Canonical’s Neil J Patel. Slick animations accompany button presses and view changes. This might sound like a small ‘blingy’ touch but it’s one that makes Gwibber 3.1 more than match up to the dominant Twitter apps available for OS X and Windows. Gwibber 3.1 also sees a number of much requested features implemented, such as sorting streams by�oldest/newest posts first, and the planned�search tool that ‘narrows what is displayed in the stream based on your search criteria’ sounds like a killer feature. As soon as Google release an API for Google+ I’m told that Google+ will be supported in Gwibber. With Ubuntu 11.10 yet to hit Alpha 3 its not surprising to find some key features are in the process of being added. The majority of the missing functions are expected to land in advance of The Ocelots release in October. 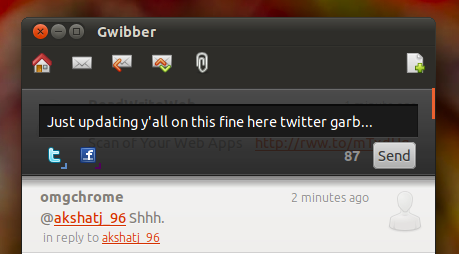 �Gwibber 3.1 will land in Ubuntu 11.10 shortly.